Exercise burns calories -- so why does your waistline expand after working out? Exercising also causes hunger and bulks up muscles. Your abdominal muscles are no exception to this rule. Do not stop exercising. Instead, learn how to moderate your eating habits. Eventually, you will burn more calories, have a leaner physique and a narrower waistline. Weight gain is not normal in the early stages of an exercise program. Exercise may be making you hungrier, causing you to eat more food than normal. Do not assume it is acceptable to eat more food just because you are working out. Beware of high-calorie, sugary sports drinks. Even healthy foods, such as whole grains and olive oil, are not necessarily low-calorie. Eat in moderation and keep track of your total calorie intake to keep your stomach flat. 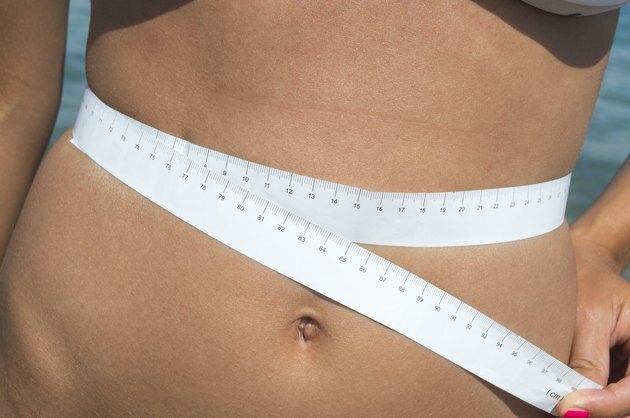 If you are trying to lose inches from your waistline by doing crunches, reconsider. According to Len Kravitz, Ph. D., situp training does not decrease the size of fat cells in your abdominal region. The only way to reduce stomach fat is to reduce your overall body fat content. In fact, over-exercising the abdominal muscles may add bulk to your waistline. To build muscle, do strength exercises that cause you to “feel the burn.” After this type of intense exercise, muscle cells, called muscle fibers, become damaged. Nearby satellite cells attach to the damaged sites and begin repairs. As the satellite cells fuse with the damaged cells, they replicate and expand, causing your muscles to get bigger. Though strength training can expand your waistline in rare situations, in most cases, it will actually make it smaller. Building muscle is actually beneficial to weight loss because it speeds up your metabolism. The more muscle you have, the more calories you burn while at rest. The boost in metabolism is small, so add other types of calorie-burning exercises to your routine. Walking, jogging and aerobic exercises burn calories and improve weight loss. So, keep doing your situps, but add other strength exercises and aerobic training to narrow your waistline. University of New Mexico; Super Abs Resource Manual; Len Kravitz, Ph.D.
University of New Mexico; Controversies in Metabolism; Len Kravitz, et al. University of New Mexico; How Do Muscles Grow? ; Len Kravitz, et al. How Fast Can Crunches Help You Lose Weight?